In Florida, someone is sending threatening official-looking letters to Republican voters. The letters appear to come from an election official and falsely insinuate that the recipients are not eligible to vote. This is yet another true case of voter fraud. It’s the type of criminal behavior that convinced me to form True the Vote. Please make an urgent donation of $20, $25, $50, $100, $250 or whatever you can afford to help True the Vote expand our anti-voter fraud programs. Election Day is only days away and it’s getting nasty out there. Already we’ve made headlines by comparing Florida’s voter rolls to New York’s. We found 63,281 people who were registered to vote in both of those states. We identified 1,925 people suspected of committing voter fraud by voting twice in one election. So far, we've turned 33 names over to the authorities and will continue to submit names as we complete the exhaustive research that is required. Here's what I know, these cases are just the tiny tip of a giant iceberg. Voter fraud is everywhere in America. Unless we really ramp up our efforts, left-wing “vote gathering” groups will steal this election! 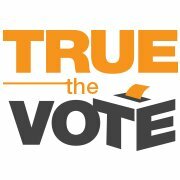 Please help True the Vote today. In Florida, we don’t know who is sending these awful letters to Republican voters. However, we do know that Florida is a swing state and these letters have been sent to voters in fifteen different counties. This is clearly an organized effort to intimidate conservative voters, and it must be stopped. Patriot, please stand with us today and help us stomp out voter fraud. Whether the “progressive” vote-collecting groups are able to steal November’s elections depends entirely on our ability to raise the money we need to stop their fraud. We need to dig into the voting data to find individuals who are registered in more than one location. We need to stand up for the rights of anyone who is being intimidated or threatened for wanting to exercise their right to cast a ballot. We need to be sure “progressive” bureaucrats enforce all voting laws equally and fairly. And we need to recruit volunteers by the thousands to man the polls on Election Day to help prevent illegal voting. It’s a massive job. That’s why I need your financial help. Please make the very most generous contribution you possibly can. Election Day is right around the corner. Early voting has already begun. And in an presidential election with margins as tight as they are, every illegal vote threatens to tip the balance of power and the future of our country. P.S. : If you would like to volunteer to help make sure November's election is free and fair in your state, please click here. Being a True the Vote volunteer is simple, doesn't take much time, and you can make a real difference for America!